This book by Don Messerschmidt is a journey of discovery of the exotic and rare breeds of large dogs from Tibet and the Himalaya such as the Tibetan Mastiff, the rare Kyi Apso (the bearded or shaggy Tibetan Mastiff), the Himalayan mountain dog and the Sha-kyi (Tibetan hunting dog). Don has undertaken thorough research on the dogs, travelled in the Tibetan plateau and the Himalayan regions of Nepal studying them closely and searched information on these dogs in the old writings of various writers, travellers, anthropologists, spies, explorers, diplomats and missionaries. He has also bred, photographed and made them participate in dog shows. An anthropologist and Himalayan specialist, Don is a Tibetan Mastiff aficionado and spent a considerable time researching, raising and breeding them. This book dispels a lot of myths about these dogs and is a must read for all big dog admirers. + Docking and cropping not to be allowed! + Yummy! I’m loving it! + It’s in his genes! Acute (sudden) pancreatitis in dog can be detected if the animal shows symptoms like vomiting, severe pain in abdomen, weight loss, weakness, loss of appetite, diarrhoea, etc. Many a time, the animal finally needs to be treated under a critical care setting. Here’s more about this disease. The occurrence of acute pancreatitis is associated with the activation of trypsinogen to trypsin which occurs inside the cells of pancreas. Trypsin is required for protein breakdown in the small intestine. Several undesirable stimuli are thought to be associated with this activation process. Once trypsin is activated, it sets in a cascade of events activating other inactive pancreatic enzymes causing pancreatic damage–a sort of auto or self-digestion, inflammation, edema, etc. Though the exact cause is not known, several factors like hyperlipidemia, high fat meal, obesity and administration of certain drugs may be the inciting cause of acute pancreatitis. Intensity of clinical signs varies from mild to severe. Mild forms may not show any clinical sign except mild uneasiness and loss of appetite. In more severe cases, anorexia, vomiting, abdominal pain, diarrhoea and weakness may be seen. Severe cases which go untreated may even proceed to a shock stage depending on the severity and the time taken or intervention. In some cases, signs suggestive of systemic involvement like fever, respiratory distress may also be seen. Neurological signs, if seen, are termed as pancreatic encephalopathy. Proper physical examination and blood test can determine the increase in neutrophil count, decrease in platelet count and anaemia. But it is not the ultimate confirmation test for acute pancreatitis. Ultrasonography is considered more specific especially with an experienced hand. Surgical exploration and biopsy procedures are also useful techniques to diagnose acute pancreatitis. Once a diagnosis is reached, treatment should be initiated based on the condition of the patient. Less severe cases can be managed with fluid and electrolyte therapy. Pain can be managed with analgesics. Ideally, animal should be maintained without any food orally. Antibiotics are indicated only in cases of pancreatic infections. Peritoneal lavage, a procedure to determine internal bleeding in abdomen, may help in removal of harmful substances which may be released into peritoneal cavity and which is quite doable. Severe cases require constant attention. If shock occurs, emergency procedures may need to be initiated for its management. (Dr Madhavan Unny N is Assistant Professor at Department of Clinical Veterinary Medicine, College of Veterinary and Animal Sciences, Kerala Veterinary and Animal Sciences University, Kerala). Have you ever thought what your dog thinks? Well, Alexandra Horowitz, Term Assistant Professor, Psychology from Barnard College, Columbia University has come up with an interesting book on the subject. Dogs & Pups interacted with her on how she came up with this wonderful idea. Excerpts. D&P: Please tell us something about your book Inside Of A Dog. 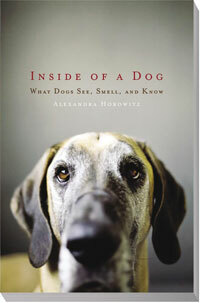 Alexandra: This book is an attempt to use scientific results about dogs’ perceptual and cognitive capacities to imagine what the world looks like from a dog’s point of view: the dog’s perspective. D&P: How did you conceive the idea of writing this book? Alexandra: I study dog behaviour scientifically, and am also a dog owner. I found that the results of research scientists were performing were not being translated to the population of dog owners, and I thought it was high time that someone must do so. I was also interested in using some results of research in a creative way to answer the kinds of questions dog owners have about their pups – questions not explicitly asked by science, such as “Do dogs get bored?” “What does my dog know about me?” and so on. D&P: What has been the response of the book so far? Alexandra: The response has been very good, which is delightful. People here in the States seem very much interested in trying to understand what dogs know and understand – how they see the world. D&P: What is the main aim of the book? Alexandra: That is the aim: to begin to draw a picture of how the dog sees the world. By doing so, I think dog owners can start to forge a new relationship with their dogs: instead of anthropomorphizing (attributing human-like characteristics to their dogs), we can appreciate what dogs are really capable of. This, in turn, can lead to being less focussed on whether a dog is “misbehaving” and more interested in how to make the dog’s life a rich one. D&P: Being a canine psychologist, please share a few things which every dog owner should keep in mind to keep their pooch happy? Alexandra: Dogs are very responsive and attentive to human movement and behaviour. If we spent half as much time studying them as they do studying us, we would learn a lot. D&P: How can a dog owner know his pooch needs attention? Alexandra: Simply because dogs can sleep a lot doesn’t mean they don’t need attention or company. Dogs are social animals, and need lots of social time. Dogs have a lot of ways to tell you when they need attention: from barking, to walking restlessly near you, to putting their head on your lap, etc. Watch your dog, and see how he tries to get your attention – and reinforce the attention-getters you like. D&P: How can we avoid behavioural problems in our pooches? Alexandra: Spend a lot of time with your dog; form a good relationship early on, where the dog knows that you will be there for him; give him lots of exercise and care; allow him to interact with other dogs from early in his life. http://www.dogsandpupsmagazine.com/wp-content/uploads/2011/11/0291.jpg 134 250 Dogs and pups Magazine http://www.dogsandpupsmagazine.com/wp-content/uploads/2017/05/1254nal.jpg Dogs and pups Magazine2011-11-16 11:52:432013-09-27 11:58:06What goes inside your dog’s mind?